First author Yasuhiro Kakimoto (left) and research team leader Assoc. Prof. Ryugo Tero (right). 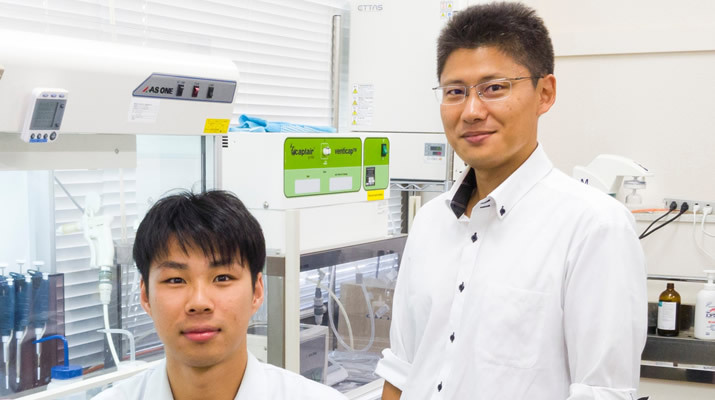 Ryugo Tero at Toyohashi University of Technology has, in cooperation with Kanazawa University, discovered the aggregates of a hydrophilic-polymer-modified lipid in a lipid bilayer membrane. An unexpected phenomenon whereby the aggregated bulky polymer appeared lower in the atomic force microscope topography was discovered, and the related causes were revealed. These findings will lead to further understanding of the function of glycolipids and membrane proteins. Lipids and membrane proteins existing in cell membranes, which form the outermost layer of cells, are responsible for recognizing extracellular environments and transferring that information inside the cell. Due to their deep relation to bacterial and viral infection, immunological response and neural transmission, they are important research topics in the fields of biology, medicine and drug development. In the reaction process of both external recognition and signal transfer, the formation of two-dimensional aggregates of lipids with bulky hydrophilic groups, such as sugar chains or inositol rings, are considered necessary in cell membranes. Small aggregates of up to 10 molecules are called clusters, while aggregates with more molecules and further growth are called domains. Lipids are amphiphilic molecules derived from organisms, and have both hydrophilic and hydrophobic properties within their molecules. Many past studies have shown that interactions with the hydrophobic part, such as the phase transition and miscibility of hydrocarbon chains, play an important role in domain formation in lipid bilayer membranes. On the other hand, interactions with the hydrophilic part of lipids have not yet been widely researched, with many factors still remaining unclear. Interactions become complicated because of repulsion occurring through the fluctuation of hydrophilic properties in the water, particularly at bulky hydrophilic parts like sugar chains. The repulsion caused by such fluctuation also affects measurements via atomic force microscopy (AFM) that can detect even the tiniest amount of force. Fig.1 Lipid bilayer domains rich in polyethylene glycol (PEG)-modified lipid. (A) Fluorescence image, (B) amplitude modulation (AM) AFM topography, and (C) frequency modulation (FM) AFM topography. A research team helmed by Ryugo Tero, Associate Professor in Toyohashi University of Technology, has used fluorescence microscopy and AFM to examine in detail artificial lipid bilayer membranes containing lipids modified by the hydrophilic polymer, polyethylene glycol (PEG) (Figure 1). The results revealed that two types of aggregates, clusters and domains, form depending on the concentration of PEG-modified lipids, and that the there is almost no fluidity in the domains that appear due to high concentration. These aggregates are formed through the interaction not with lipids’ hydrophobic part, but rather with their hydrophilic part. Interestingly, when observed with AFM, the PEG-modified lipid domains that should have been bulky, were observed at a lower level than the surroundings (Figure 1B). Associate Professor Tero implemented a joint experiment with Professor Takeshi Fukuma in Kanazawa University to determine the reasons for this. By utilizing frequency modulation AFM (FM-AFM), and accurately controlling the force between the sample and the probe, they were able to observe the PEG-modified lipid domain at a higher level than the lipid membrane area, without the application of any amount of force (Figure 1C). Since repulsions will change due to the fluctuation of hydrophilic polymer chains dependent on the force applied, it has been found that a reverse image of the true three-dimensional structure can always be observed during an amplitude modulation AFM (AM-AFM) observation (Figure 2). "In order to establish an experimental method for examining glycolipids’aggregate state and function, we utilized PEG-modified lipids that are easy to obtain at the very beginning. We struggled to find the most suitable conditions for sample preparation and AFM observation of the lipid bilayer membrane containing PEG-modified lipids. The results differed greatly in comparison to expectations, especially due to the fact that the recessed areas grew relative to the increase in concentration of PEG-modified lipids. Thinking there might have been a mistake, we repeated the experiment and confirmed its reproducibility. Intuitively, it may seem unlikely that the region with bulky molecules appears lower with AFM, but when the assembled state of the polymer and the basic principles of AFM are considered, this is actually very reasonable. “ The Eureka moment for our joint experimental group with Kanazawa University came when we observed how the concave-convex properties of the surface reversed after switching to FM-AFM” explains the main author, Yasuhiro Kakimoto. Mr. Kakimoto is currently enrolled in a doctoral course at Toyohashi University of Technlogy, as a part of the Program for Leading Graduate Schools organized by the Ministry of Education, Culture, Sports, Science and Technology. Fig.2 Force-dependent topography of the PEG-lipid-rich domain. The principle of domain formation due to interactions with hydrophilic polymer chains identified as a result of this research has been found to share commonalities with glycolipids in the cell membrane. Our research team is of the opinion that this principle will assist with the understanding of the mechanism of cell recognition and signal transfers related with the aggregate state of glycolipids and membrane proteins. Furthermore, the findings from the experiments, in which bulky objects can appear sunken-in depending on the conditions, will be valuable for the many researchers analyzing biological molecules underwater through atomic force microscopy. In addition, PEGs have the effect of suppressing nonspecific adsorptions such as proteins, etc., and can also be utilized in bio-interfaces and drug delivery. The formation and force response of PEG-rich clusters and domains are expected to have a pervasive effect also in these fields. This work was supported by the Japan Society for the Promotion of Science KAKENHI Grant Numbers JP15H03768 and JP15H00893; CREST, Japan Science and Technology Agency (JST) Grant Number JPMJCR14F3; A-STEP, JST. 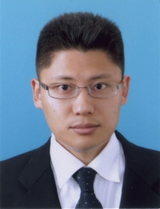 The first author Yasuhiro Kakimoto also received a grant as part of the Program for Leading Graduate Schools run by the Japan Society for the Promotion of Science. Yasuhiro Kakimoto, Yoshihiro Tachihara, Yoshiaki Okamoto, Keisuke Miyazawa, Takeshi Fukuma, and Ryugo Tero (2018). Morphology and Physical Properties of Hydrophilic-Polymer-Modified Lipids in Supported Lipid Bilayers, Langmuir, 34(24), 7201-7209.